Your lives have ended. What you do with your new lives is entirely up to me. That’s the law. Now go and kill this guy. Based on the manga by Hiroya Oku, Gantz proves that a good story cannot be killed by a poor adaptation. Kei Kurono and his friend Masaru Kato are hit by a subway train when they were trying to save a drunkard who fell from the platform. The next moment they find themselves in a strange room, empty except for a mysterious black sphere. There are other people in the room, most of them convinced that, like Kurono and Kato, they have died today. The people are wondering whether it is some kind of afterlife or a mass hallucination, when a cheerful radio song sounds from the sphere. On the black surface a message appears informing the survivors that from now on their lives belong to the sphere, – GANTZ, as they learn later, – and all of them are chosen to fight the aliens invading the Earth. 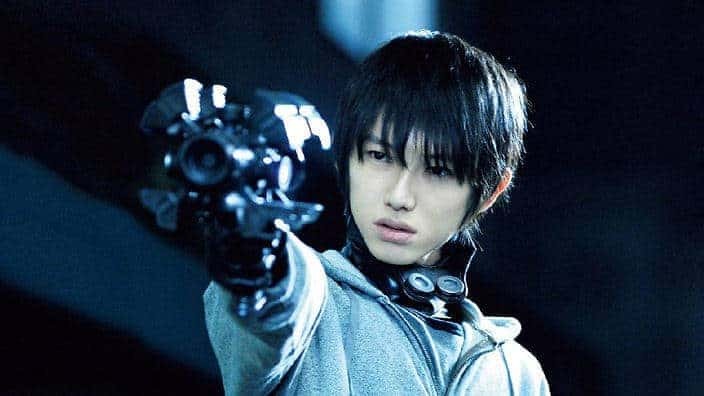 Gantz provides the group with futuristic-looking weapon and armor suits, giving their owners superhuman powers, which increases their chances against the alien monsters. What is Gantz? Where it’s come from? Why it chases aliens and why it gives people new lives to send them into battle? None of the newly-created fighters know. What they do know is that Gantz gives out points for each kill and can summon them back any moment for a new mission. The only way to be free again is to get 100 points… and survive in the process. Before watching the movie I’ve promised myself not to compare it to any other adaptations. After all, you cannot expect hundreds of chapters to fit into about two hours of running time. What you would expect, though, is a hard-boiled action movie, violent and gory and balancing just this side of a trashy slasher, yet suddenly deep, with skillfully built up suspense. This is what makes Gantz so brilliant and addictive. Unfortunately, the film is an abridged and censored version of the original story turned into a clichéd drama with all the obligatory angst and moral dilemmas of a teenage-oriented movie. Unfortunately, the film is an abridged and censored version of the original story turned into a clichéd drama with all the obligatory angst and moral dilemmas of a teenage-oriented movie. It is not a bad drama, but nothing more than a fill-in between the fighting scenes. Being functional, it is more of a background summary than an absorbing story. When it gets to fighting, the action surprisingly… lacks of fighting. While somebody gets ripped apart, the others just stand aside, apparently waiting for their turn. Why it takes the entire movie for the characters to realize that lining up in front of a monster isn’t a good surviving tactics, is hard to say. Besides, the moments when a character has a clear shot at the monster but chooses to turn away and run or just freezes waiting for a more dramatic opportunity, are so numerous and annoying that no suspension of disbelief can endure. Of all the adaptations of the manga, the action movie appears to be the most disappointing one. So why it is still a must-see movie? For one, it is still Gantz. A good story is a good story (thanks to Hiroya Oku), and the suspense and the mystery are in place. Even if the narration is much more tame and schematic, the story is well balanced: as soon as you start feeling bored, there’s another fight or a comic relief. The filmmakers know how to keep our attention. The acting is certainly a strong side of the movie. Ninomiya and Matsuyama create a very convincing duet as Kurono and Kato. Natsuna Watanabe as Kei Kishimoto makes the most of the screen-time, even though her story is altered and mostly left out. As for the other supporting characters, seems like the filmmakers remembered about them only when it’s time to put on the suits. Still, they manage not to look like a bunch of cannon-meat extras (even if they die two minutes after the appearance). Another strong point is the special effects and make-up. 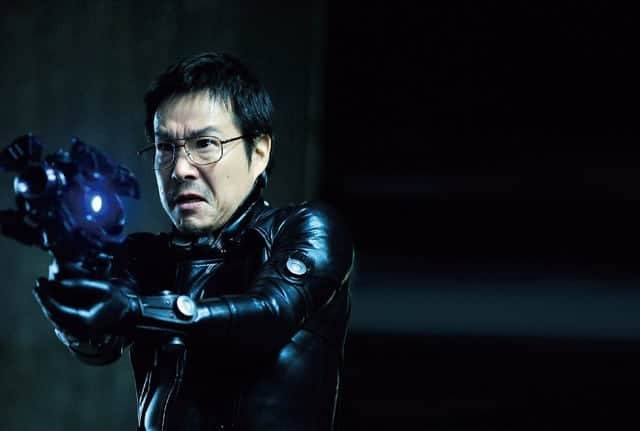 Everything looks convincing and real, from the iconic Gantz suits and weapons to the living statues, the plastics of which is life-like and frightening. The cinematography won’t strike you as innovative, yet it looks fresh and dynamic. The contrast between the mild lighting of the interiors and everyday settings and the scenes of the night city, dark and shadowy with ghost-like neon flashes, creates an intense feeling of threat. The normal life of the characters seems bland and unreal, while the night is the reality, where monsters are lurking in shadows. The soundtrack by Kenji Kawai (The Red Spectacles, Ghost in the Shell, Ring and Ring 2) perfectly stresses the atmosphere, combining the futuristic drive of the action with dark and eerie almost Gothic motifs. 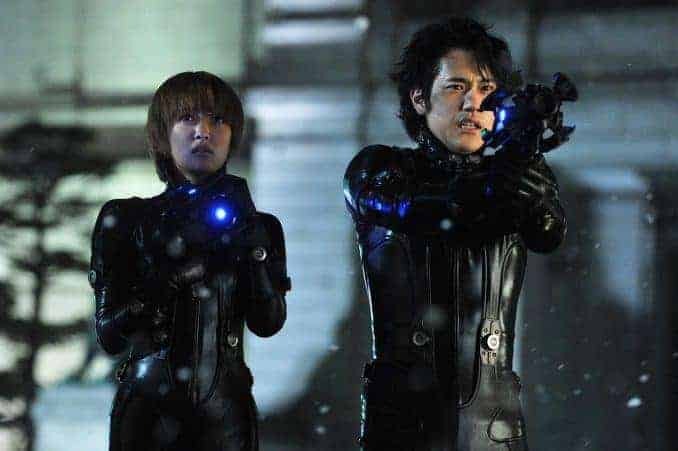 All the annoying drawbacks notwithstanding, Gantz is a well-written and beautifully filmed movie with impressive special effects and a strong team of actors. The fans of the original series may be disappointed, but the movie is definitely worth watching as any good sci-fi action movie with a good plot, convincing characters who are skillfully pushed to their limits and the peculiar dark and violent atmosphere of the Gantz universe.